How to store dry fruit? 1.8 Are nuts suitable for babies? 1.9 Who should not take or moderate nuts comsumption? Fruit is highly recommended, because, in addition to carbohydrates, it contains many vitamins and minerals that are essential for health. However, we should not eat too much fruit, and we should moderate fruit intake in case of metabolic problems, such as diabetes or obesity. Nuts should be eaten ripe. 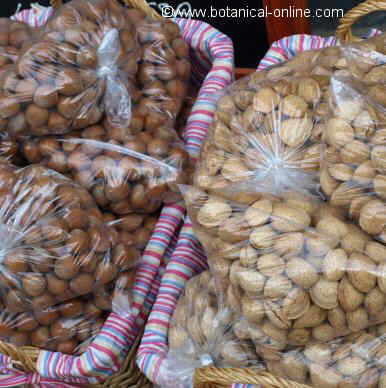 Unmatured nuts can develop toxic substances that maturation transforms and makes edible. It is particularly interesting to note, for example, that tender almonds can not be eaten green because they have amygdalin, a component that, once ingested, produces cyanogenic glycoside (cyanide). This component disappears when ripe. Nuts should be stored in good condition. When this type of fruit is not stored in good conditions (bad storage conditions, such as at temperatures between 25 and 30 º C, with humidity values above 80%, ventilation problems and lack of light), fruits fungi coming from cultivated fieds can develop producing mycotoxins. Mycotoxins are toxic substances for the human body. Some of them are very damaging, such as aflatoxins. Aflatoxins are most harmful. They consist on waste products that some fungi produce, mainly Aspergillus fungi. Mycotoxins have proven to be very harmful to health, in both humans and animals, for their toxic effects on the nervous and immune systems and their role in the development of liver cancer. To buy these products usually from reliable brands. Reject those fruit with mold, if they are very dry or with abnormal colors. Try to buy packaged products, avoiding those sold in bulk. Keep them from going rancid. Eat them as soon as possible after opening the package and keep them in suitable place, in a dry one, away from heat sources. Some nuts can cause food allergies. This type of allergy is usually more common with peanuts, but it can occur with other nuts. Food allergy can cause very serious reactions, even asphyxia. Therefore, when eating a nut for the first time, if you experience some negative reaction in the body (itching, nausea, voice changes, sorethroat, stomach pain, diarrhea, dizziness, etc..) it is best to stop eating this food and see a specialist. Yor doctor will apply you some tests to see if you suffer from a food allergy. The tests are specially appropriate for young children with a history of allergy in their families. In this case, the suitable tests should be performed before young children start to eat nuts for the first time. The allergy to these foods is chronic and requires not to eat them over a lifetime. This applies to nut derivatives, such as oil or butter. The patient must learn what foods to eat and what not to eat. Are nuts suitable for babies? Nuts are not recommended for babies. The possibility of an allergic reaction, along with the difficulty of chewing are two reasons why nuts are not suitable for babies under 2 years. It is also desirable to introduce these foods in small amounts, to anticipate to a potential food reaction. Who should not take or moderate nuts comsumption? In addition to babies under two or people who are allergic to these fruits, obese people or people on a low fat diet should moderate the consumption of these food, because nuts are very caloric. Salted nuts are not recommended for people who may have problems with sodium, such as those suffering from hypertension or liquid retention.